April 7 (Sat. 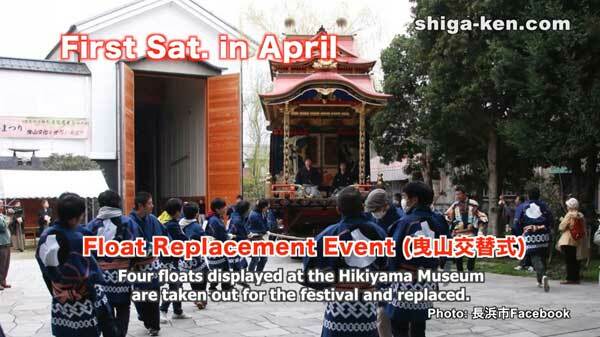 ), 10 am–3 pm: At Hikiyama Museum, exhibited floats to be replaced. Details here. 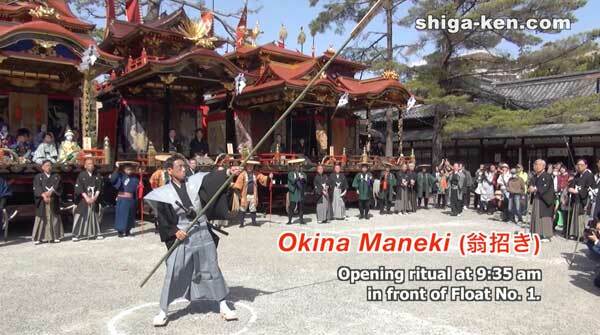 April 9th–12th, from 8 pm: Hadaka-mairi worship at Nagahama Hachimangu and Hokoku Shrine. Details here. April 10th–12th: Child kabuki practice open to the public. Details here. 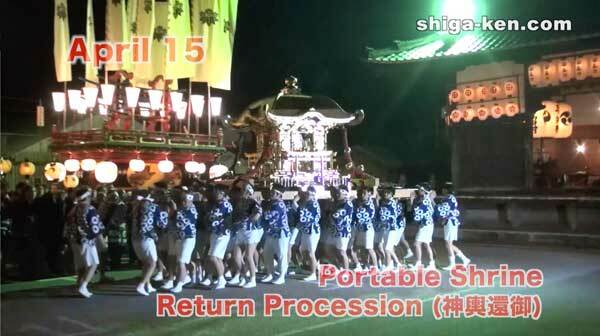 April 12, from 6:30 pm: Portable shrine procession from Nagahama Hachimangu to Hokoku Shrine and Otabisho. Details here. 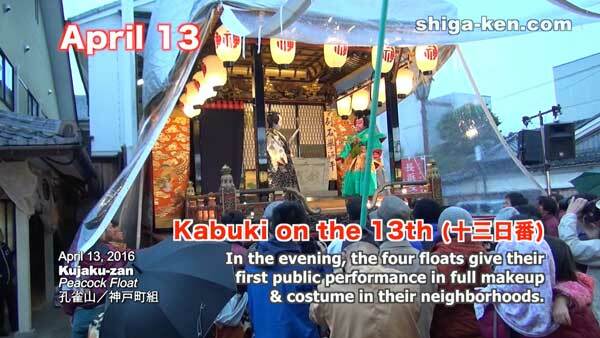 April 13, from 5:30 pm: Child kabuki performances in local neighborhoods. Details here. April 14, 9:30 am to 1 pm: Child kabuki performances in local neighborhoods. Details here. 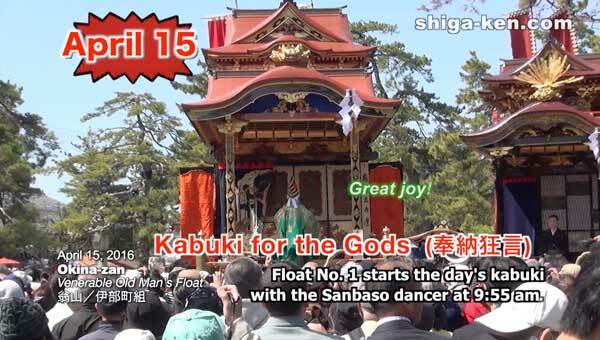 April 14, 1 pm to 4 pm: Float procession to Nagahama Hachimangu. Details here. 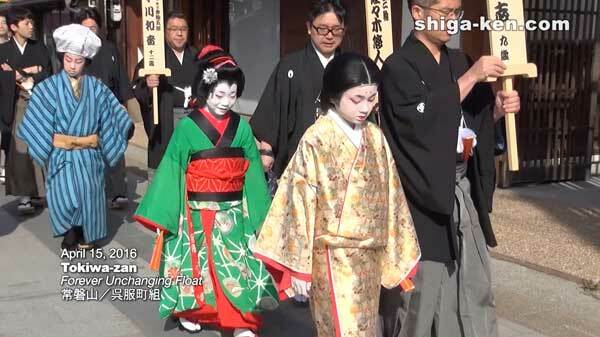 April 14, at 7 pm: Child kabuki evening procession from Nagahama Hachimangu to Hikiyama Museum. Details here. April 15 (Main day): Child kabuki performances all day at Nagahama Hachimangu Shrine (10 am to 2:15 pm), Otemon Arcade, and Otabisho (4 pm to 8:15 pm). Details here. April 16, 9 am to 9 pm: Child kabuki performances from 9 am to evening in local neighborhoods. Details here. When you arrive at JR Nagahama Station, you should go to the tourist information center outside the turnstile and ask what time and where the floats will perform kabuki. If you will see the festival on April 15, the main day, you can conveniently see all four floats perform kabuki in succession (40 min. each) at Nagahama Hachimangu Shrine from 10 am to 2:15 pm. If you arrive Nagahama later in the day, you can see all four floats perform in succession at the Otabisho (large parking lot) near Nagahama Station from 4:00 pm from 8:15 pm. You can also walk between Nagahama Hachimangu Shrine and the Otabisho (see map below), especially along Kurokabe Square and the Otemon shopping arcade where the floats will pass or perform in the afternoon. You can see the floats up close (artwork, etc.) while they are parked. Each of the four floats will perform kabuki four times on April 15 for a total of 16 kabuki performances. So there will be a kabuki performance once or twice every hour from 10 am to 7:35 pm. You can easily see one or more kabuki performances somewhere in central Nagahama during this time. Be aware that it is “standing room only” for all kabuki performances. It can be tiring to watch all four kabuki performances while standing. You could bring a collapsible chair, but people standing in front of you will block your view. (Although a limited number of paid seating is available at Nagahama Hachimangu Shrine, they sell out quickly.) If you plan to see the festival in the evening, the temperature can get much cooler so bringing a jacket is advisable. All festival events are within walking distance from JR Nagahama Station on the JR Hokuriku Line. Since there’s no detailed festival information and schedule in English from official sources, I provide this festival schedule in English based on official festival information and my recommendations. With a little knowledge of what’s what and what’s going on, I’m sure you’ll be able to enjoy this festival much more after reading this post. There are 12 kabuki floats (called hikiyama) with a kabuki stage and one “guardian” float named Naginata-yama with no stage. Every year, only four of the kabuki floats perform kabuki at the festival. Three groups of four kabuki floats take turns appearing in the festival each year so each float group appears (performs kabuki) every three years. The same four floats appear together each time. 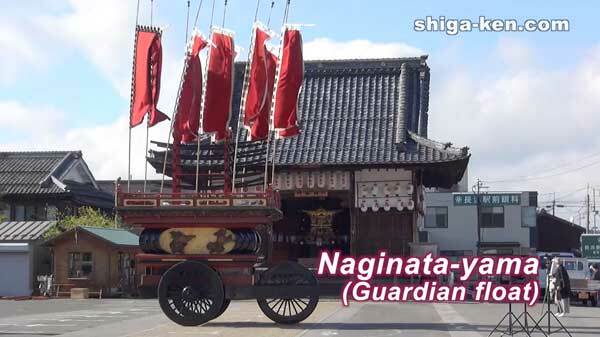 Only the Naginata-yama guardian float appears in the festival every year, but does not perform kabuki. To see all 12 kabuki floats, you would have to see the festival three years in a row. Although April 15 is the main festival day (called Honbi 本日), there is a slew of festival events and kabuki performances before and after this day. If you can’t make it to Nagahama on April 15, you can still see kabuki performances on April 13 (evening), 14 (morning), and 16 (all day). 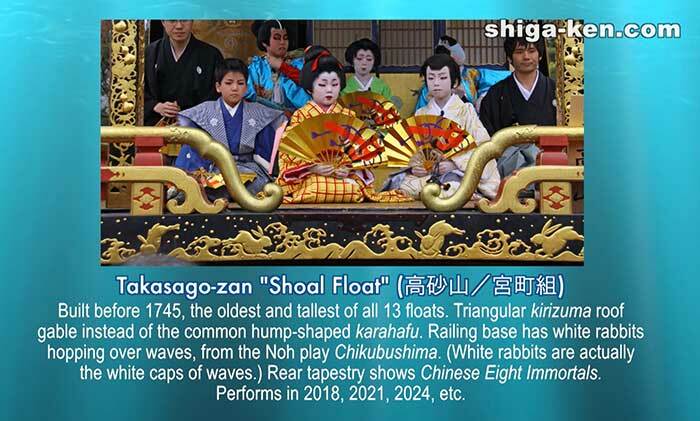 Another thing to know is that the four kabuki-performing floats draw lots to determine the order of their performances. Being Float No. 1 is most desirable since they get to perform first on April 15 (main festival day) and can end early and go home early. They also have the honor to host the Sanbaso prayer dancer who performs before their kabuki play. According to legend, when Toyotomi Hideyoshi was the lord of Nagahama Castle, his first son Hashiba Hidekatsu was born in the early 1570s. To celebrate his son’s birth, Hideyoshi gave gold dust to the townspeople. The people used the gold to make a wooden float to celebrate the son’s birth. Hideyoshi paraded the float at Nagahama Hachimangu Shrine. 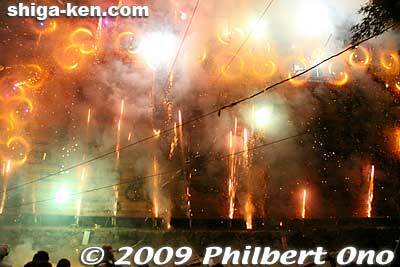 This was the start of the Nagahama Hikiyama Matsuri. This legend is often told, but it is not true. Nagahama Hikiyama Festival originated from an annual samurai procession held by Nagahama Hachimangu Shrine founded in 1069 by the famed samurai Minamoto no Yoshiie (1039-1106). The shrine worships Hachiman (Emperor Ojin), the divine guardian of samurai. In the late 16th century, daimyo Toyotomi Hideyoshi relocated the shrine to make way for his Nagahama Castle on the shore of Lake Biwa. At the same time, Hideyoshi rebuilt Nagahama Hachimangu that had been ravaged by war. The shrine’s annual samurai procession dedicated to Minamoto no Yoshiie was also resurrected with Hideyoshi’s samurai retainers. By the 18th century well after Hideyoshi’s death, the samurai procession became more elaborate with wooden floats being added. When kabuki became popular in the 18th century, Nagahama’s townspeople thought about staging kabuki on the floats. They asked the prominent carpenter and woodcarver family of the late Fujioka Izumi (1617–1705) to design a float having a kabuki stage. The early floats were much simpler than today’s floats. The Fujioka family went on to design and build many of the floats. The idea of staging kabuki on festival floats spread from Nagahama to float festivals in nearby prefectures like Gifu. Here is a detailed schedule of Nagahama Hikiyama Festival events in 2018 (times are approximate, and delays may occur). Also see the festival map toward the end of this post. The photos are screenshots from my video embedded above. Click on the photo to see the respective video segment. 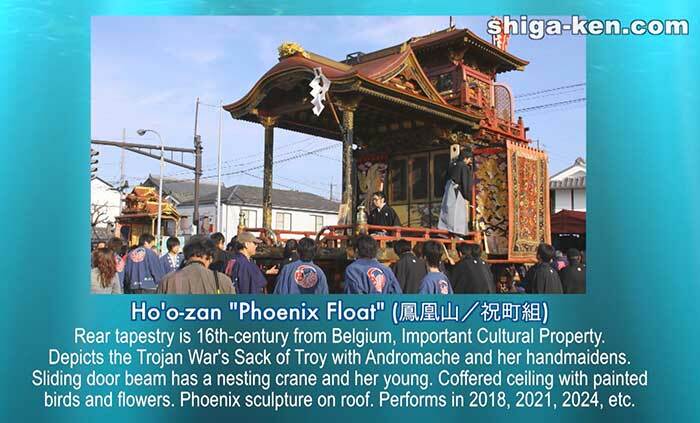 10:00 a.m. to 3:00 p.m.: The hikiyama floats exhibited in the Nagahama Hikiyama Museum will be pulled out and taken back to their neighborhoods to prepare for the festival. Then the four floats appearing in next year’s festival will be brought into the museum to be displayed. Festival officials visit the four floats’ kabuki practice halls to watch a kabuki rehearsal and time the performance. 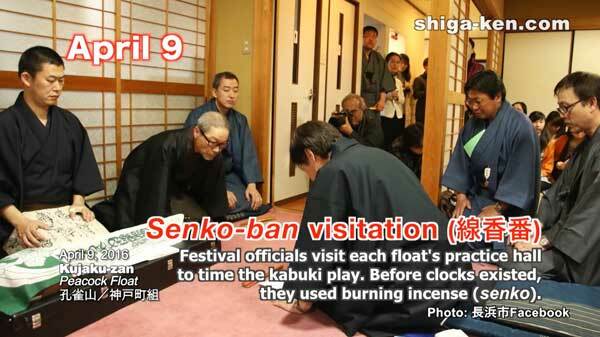 Before clocks were invented, they used a burning incense stick (senko) to measure the kabuki play’s length. This is also when the parents see their sons perform for the first time. However, the actors do not wear the makeup and costumes yet. This ceremony is not open to the public since the practice hall will be filled with the boys’ parents and relatives. From 8:00 p.m. every night on these four days, scantily-clad young men (wakashu 若衆) from the four floats gather at their respective kabuki practice hall and parade to Nagahama Hachimangu Shrine where they pray and purify themselves by running around a well and splashing themselves with the cold well water. They pray for a successful festival, healthy actors, and to draw a favorable lot on April 13 that determines the order of the floats’ performances. They all want to be Float No. 1 which performs first and goes home first on April 15 (main day). 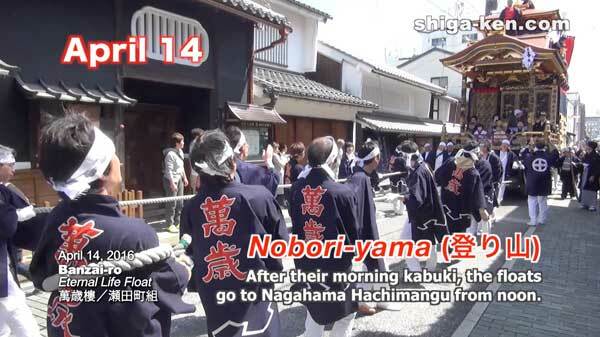 From Nagahama Hachimangu Shrine, they march through Otemon-dori shopping arcade to Hokoku Shrine across town where they pray and splash in a well again. On their last worshipping day on April 12, Otemon-dori shopping arcade has festival musicians and representatives from non-performing floats (i.e. those not performing in the festival this year) to greet the wakashu men. They play festival music (called shagiri 囃子) and offer cups of sake (rice wine) to the wakashu leaders and Kujitori-nin. They shout “Yoisa! Yoisa!” the whole time and drink a lot of sake. You will notice that they wear different colored headbands. 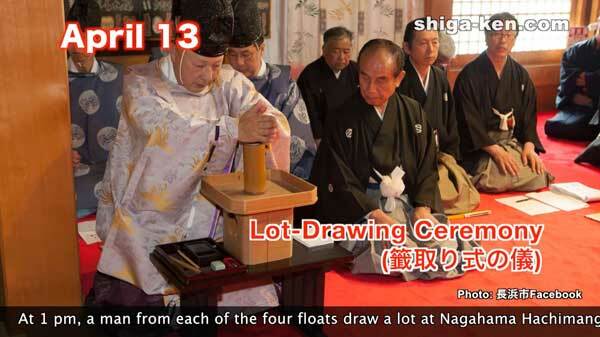 The young man wearing a red headband is the Kujitori-nin (籤取り人) who will draw the lot at the lot-drawing ceremony on April 13. The men wearing a blue headband are the guards (警護) who direct the wakashu. The men with a white headband are the rank and file. When a float’s wakashu pass by another float’s wakashu, a scuffle may break out since they are rivals in drawing lots. Quite a spectacle at both shrines and in-between. From 6:30 pm, men carry a mikoshi portable shrine from Nagahama Hachimangu Shrine to the Otabisho rest place across town while shouting, “Yoisa!” They go through the Otemon-dori arcade and a few side streets. Along the way, festival musicians from other floats greet the portable shrine (no sake is served). Nagahama Hikiyama Matsuri’s festival music is called shagiri (しゃぎり) instead of hayashi (囃子). The portable shrine was made in 1676 by Fujioka Kanbe’e (藤岡甚兵衛) with donations from shrine parishioners. The Fujioka family was a renown woodcarver and Buddhist altar maker in Nagahama. The portable shrine brings the deity closer to the people and chases away evil spirits. They occasionally raise the portable shrine to wish happiness and safety to the people around it. 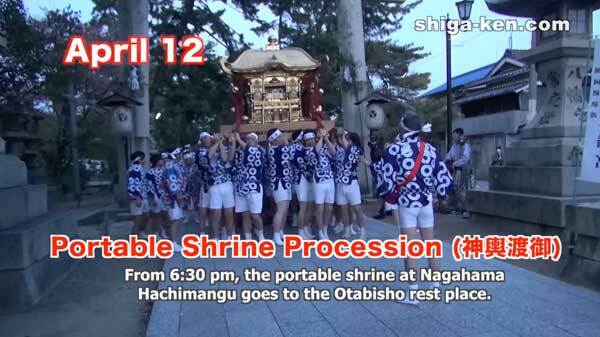 The portable shrine arrives at the Otabisho at about 7:30 pm. The Otabisho is a rest place for the god traveling in a portable shrine. The portable shrine remains in the Otabisho until April 15 evening. Anybody can watch them practice without any reservation or admission fee, but they do not wear the kabuki makeup and costumes (no dress rehearsals). They have been practicing every day since March 20 (spring vacation), so by this time, they have mastered their roles quite well. They receive some fine-tuning during this time. When you watch them practice so hard (sometimes they even break down and cry), you will come to appreciate how much work it takes to put on a kabuki play. You can also see what the boys really look like without the kabuki makeup. Then when you do see them in kabuki makeup (from April 13), you will be amazed at their transformation. And after the kabuki makeup and costumes. The kabuki play is directed by three instructors called San’yaku (三役): The choreographer, tayu narrator, and shamisen player. The choreographer casts the actors’ (yakusha) roles usually according to their physical attributes. The choreographer is usually an experienced kabuki actor and directs the actors’ movements and voice. The tayu narrates the story in a highly stylized manner like in kabuki. The shamisen player provides the only music played during the kabuki performance. 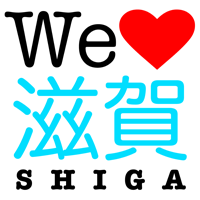 Since 1990, the Nagahama Hikiyama Cultural Association (長浜曳山文化協会) has been working to train local artists to become tayu narrators and shamisen players in the festival. In 2016, for the first time, all four floats had at least one locally-trained tayu narrator or shamisen player. Previously, they were all from outside Shiga. Each performing float also publishes its own festival program booklet or brochure introducing the float and kabuki actors in Japanese. (If it has English, it’s usually not very good.) You can buy one for cheap at the practice hall. *Tip: On April 12, you can see three different festival events: Kabuki practice during the day, the portable shrine procession from 6:30 pm, and the hadaka-mairi shrine worshippers from 8 pm. The main events on this day are the lot-drawing ceremony and the first kabuki performances in full costume for the public held in the evening. Taiko Drum Call (起し太鼓): Before dawn at all float neighborhoods, a small team walk around and beat a taiko drum as a wakeup call. 7:00 a.m.: Representatives (including the Sacred Staff Messenger age 5–7) from the four floats go to Nagahama Hachimangu to receive their sacred staff (zigzag paper streamers) to be mounted on their floats. 1:00 p.m.: This ceremony is held to draw lots to determine the order of the four floats’ kabuki performances. Being Float No. 1 is most desirable since they get to perform first on April 15 (main festival day) and can end early and go home early. They also have the honor to host the Sanbaso prayer dancer who performs before their kabuki play. At Nagahama Hachimangu Shrine, four unmarried lads representing the four floats wear a red headband (like they did at the Hadaka-mairi) and sit in front of the shrine priest inside the worship hall. They are the lot drawers (Kujitori-nin). Four pieces of paper are written with float numbers one to four. Each piece of paper is crumpled into a ball and placed on a tray as a lot to be drawn. There is a tray for each lot, and each lot drawer selects and carries back a tray. While sitting together, they all open their paper lots at the same time to see who is Float No. 1, 2, 3, and 4. The Lot-drawing ceremony is not for the public since the shrine’s worship hall is too small to allow the public inside to see the ceremony. However, you can see them from outside celebrating (throwing the lot drawer into the air, etc.). 5:30 p.m. to around 8:30 p.m.: The four floats hold their first public kabuki performances in full makeup and costume in their respective neighborhoods. (For exact performance times and locations, see the official festival guide book in Japanese or ask the tourist information desk at Nagahama Station.) Each float will perform kabuki only once or twice this evening. In case of rain, the float will be covered with a tarp or moved to the shopping arcade for shelter. Float No. 1 receives the honor of hosting the Sanbaso dancer. The Sanbaso dances on Float No. 1 before the float’s kabuki play and he is the first performer on April 15 (main festival day) at the shrine. He holds a bell tree shaped like a ripe rice plant and performs prayer dances for a rich harvest. The Sanbaso performs two short dance segments. The first segment is Momi-no-dan (stomping segment) where he waves his sleeves and stomps on the ground like he is preparing the ground for planting. He also does the “crow jump” (karasu-tobi) by jumping three consecutive times. The second segment is Suzu-no-dan (bell segment) when the Sanbaso shakes his bell tree and mimes the planting and growing of rice. His costume has a crane design and his high cap has tiger stripes and a red sun on both sides. The Sanbaso is a well-known dancer in Noh and kabuki. He comes from a Noh prayer dance called Okina (翁) dating from the 14th century as a religious ritual. Okina has three dancers praying for longevity, peace, endless joy, prosperity, and rich harvests. Sanbaso is the third dancer in Okina which is traditionally performed on auspicious and celebratory occasions like New Year’s and at the beginning of the day’s Noh or kabuki program. This is why he always appears first on the main festival day. The Sanbaso dances each time the float performs during the festival days. 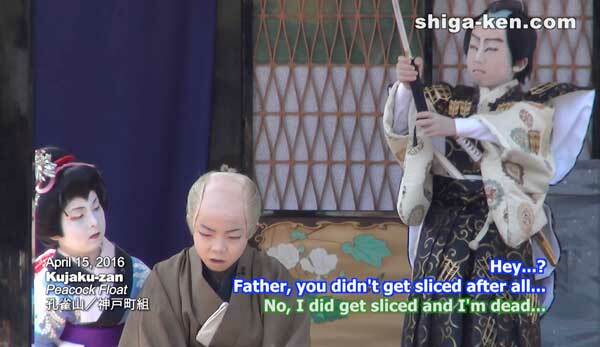 The boy playing the Sanbaso is recruited from the public in Nagahama and he is around age 10. He has his own choreographer, tayu narrator, and shamisen player. Ciick here to see the Sanbaso video clip. The day before the main festival day is also a busy day. Lots to see/photograph. 9:30 a.m. to 1 pm: Morning performances of kabuki plays are held by the four floats in their respective neighborhoods. The floats perform once or twice in the morning. For exact times and locations, see the official festival guide book in Japanese or ask the tourist information desk at Nagahama Station. 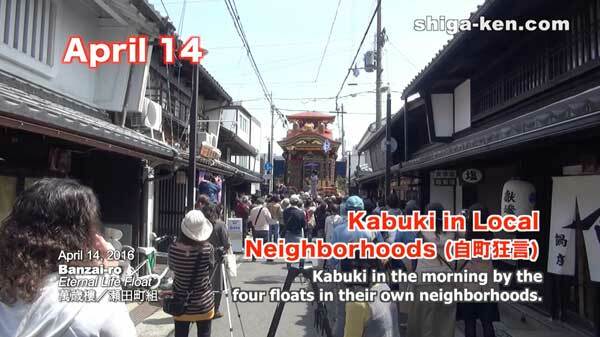 1 pm to 4 pm: After they finish their morning kabuki performances, the four floats proceed from their neighborhoods to Nagahama Hachimangu Shrine. Float No. 4 arrives at the shrine first, followed by the others in reverse numerical order. All four floats arrive at the shrine by 4 p.m. It’s a spectacle to watch them pull the floats through the streets and the shopping arcade as they shout “Yoisa! Yoisa!” It’s a stop-and-go process. 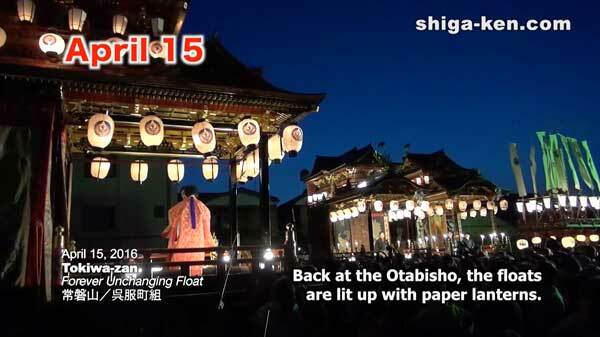 Meanwhile, the Naginata-yama float is pulled from its storehouse across town and arrives at the Otabisho rest place at 4 p.m. It is the only float that does not go to the shrine. 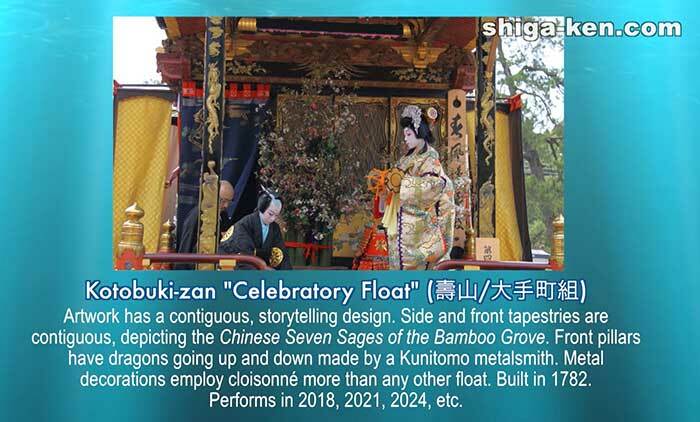 This is the only float with no kabuki stage, an Imperial-style carriage with only three wheels. Carries banners and long swords. 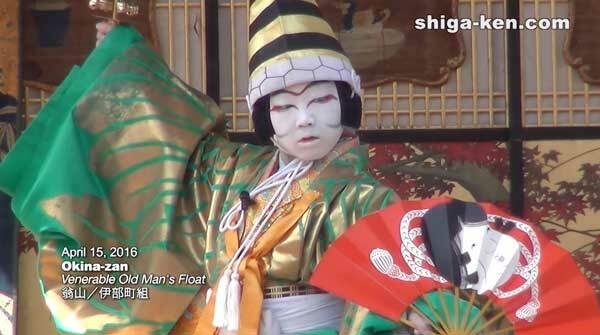 A ceremonial and “festival guardian” float appearing every year on April 14-15 only at the Otabisho. It does not go to Nagahama Hachimangu Shrine. Built in 1775 with Chinese lion sculptures on four sides. It’s a nice float, but does not attract the crowds. It’s a quiet float. After the Sword Procession on April 15, red banners are hoisted on the float. Before Float No. 1 arrives at the Otabisho in the late afternoon, Naginata-yama’s red banners are replaced by white ones bearing the Minamoto Clan’s crest. The float’s caretaker is the Naginata-gumi association from the lakeside Kobuna-machi neighborhood (小舟町 now in Asahi-cho) where Minamoto Yoshiie landed for his victory march to Nagahama Hachimangu. 7:00 p.m.: Evening procession of all the child kabuki actors in full costume walking from Nagahama Hachimangu Shrine to Nagahama Hikiyama Museum through Otemon-dori shopping arcade. It starts with actors from Float No. 4, then No. 3, 2, and 1. Occasionally, the actor will stop and pose for photographers. 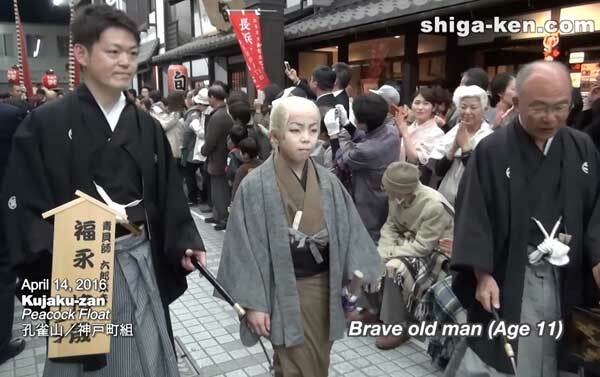 Each actor is escorted by an adult relative (usually the father) holding a paper lantern and wooden placard indicating the actor’s name, age, and kabuki character. The procession includes festival musicians (no floats). A real crowd pleaser for locals and tourists alike. All the kabuki actors (and stagehands) are treated like royalty during the festival. They receive gifts from relatives and friends and are very much pampered by their parents for undertaking such a difficult and rigorous task of kabuki acting. (A few of them even do it more than once.) The mothers have to make sure they don’t get sick or catch cold. This childhood experience stays with them for life and many of them come back to Nagahama to help out with the festival. In recent years, the floats have had difficulty recruiting kabuki actors (and musicians) since there are fewer kids in their neighborhoods. The festival’s peak day with kabuki performances here and there in central Nagahama from 9:45 am to 8:15 pm. The four floats start at Nagahama Hachimangu Shrine where they perform in succession. Then they start moving toward the Otabisho and perform three more times at multiple locations (see map below). Before and after the kabuki performances, there are other processions and ceremonies. Note that the floats can be prone to be late (especially in the evening), so the time schedule is only approximate. Before dawn: Taiko Drum Call (起し太鼓) at all float neighborhoods. 7:00 a.m.: Spring Festival Ceremony (春季大祭). A religious ceremony, not really for tourists. 8:30 a.m.: Morning Kabuki Procession Arrival (Asa-watari 朝渡り) of child kabuki actors arrive at Nagahama Hachimangu Shrine. Colorful procession, but too early in the morning for spectators. 9:20 a.m.: Sword Procession (Tachi-watari 太刀渡り) of sword bearers arrives at Nagahama Hachimangu Shrine after going through Otemon-dori arcade. Led by a golden sacred staff, this procession reenacts the Hikiyama Matsuri’s original samurai procession before floats were added. Young men wear ceremonial aprons (similar to sumo wrestlers) and young boys wear samurai armor and a long naginata sword (2–3 meters long). They depict Minamoto no Yoshiie’s victory march to the shrine after he won the Gosannen War (1080s) in the Tohoku Region. Minamoto no Yoshiie was a famous samurai who founded Nagahama Hachimangu Shrine in 1069. By the 16th century, Nagahama Hachimangu was ravaged by civil war, so Nagahama Castle Lord Toyotomi Hideyoshi moved and rebuilt the shrine at its present location further inland. He also used his own samurai retainers to restart the shrine’s annual festival procession dedicated to Minamoto no Yoshie. 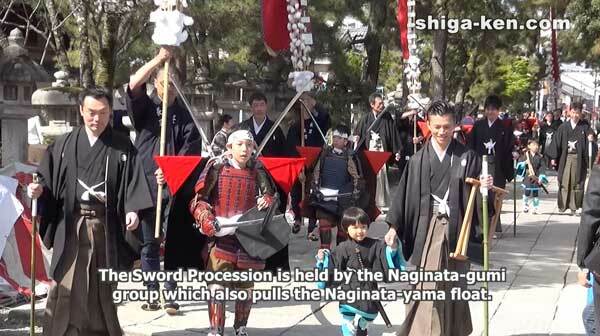 The Sword Procession is conducted by the Naginata-gumi group which also pulls the Naginata-yama float. It has the Matajirohama beach (又次郎浜) where Minamoto no Yoshie landed for his victory march to the shrine. After resting at the shrine for a short period, the Sword Procession goes to the Otabisho to mount their long swords on the Naginata-yama float. 9:35 a.m.: Okina Maneki (翁招き) is an opening ritual held in front of Float No. 1 to mark the start of kabuki performances. A long bamboo pole attached with a wooden placard is waved to the shrine and to Float No. 1 as a signal to start the festival and the festival music begins. Float No. 1 is then moved into position for the first kabuki performance (opening with the Sanbaso dancer). 10:00 a.m.–2:15 p.m.: Kabuki at Nagahama Hachimangu Shrine (Hono kyogen 奉納狂言) has the four floats perform kabuki at Nagahama Hachimangu Shrine in succession starting with Float No. 1. These performances are dedicated to the gods. Each play is about 40 min. long. After a float finishes a kabuki performance, it leaves shrine and goes to the next performance location on the way to the Otabisho. The next float is then moved into position in the shrine to give its kabuki performance. So there is a break time between performances. If you want to see all the kabuki plays on the four floats, one option is to stay at the shrine to see all of them. But it’s standing room only, so you may get tired standing for that long. 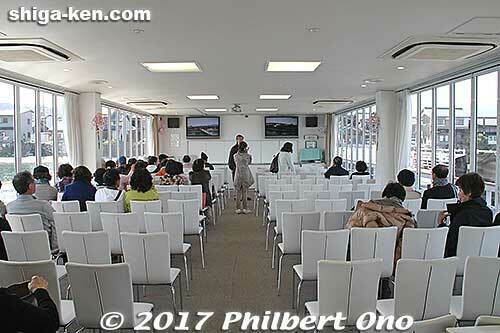 There is paid seating, but they require advance tickets (costing a few thousand yen) sold in Feb. and usually sell out quickly. If you sit on the ground, you won’t be able to see the float since everyone is standing in front of you. You can just watch one or two floats at the shrine, take a break, and watch the other floats at other locations and times. For kabuki performance times at the shrine and elsewhere, see the table below. All four floats will also perform at the Otabisho later in the afternoon and evening (also standing room only). Each float has five to seven kabuki actors and one or two stagehands. There used to be more actors like 10 or more per float, but there are fewer kids now. It’s also quite expensive to rent the kabuki costumes. 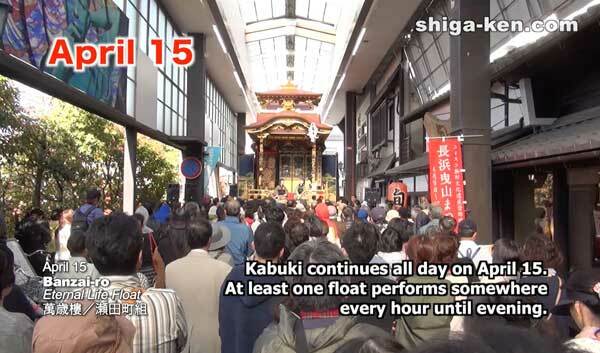 Since each kabuki float performs every three years, that’s how long they have to raise money for the festival. Although watching the kabuki is impressive without even understanding it, you would enjoy it more if you knew the kabuki story. Most of the kabuki plays are well known and you may be able to find an English synopsis online if you know the kabuki play’s title in Japanese or English. Sometimes the kabuki play includes something about Nagahama. 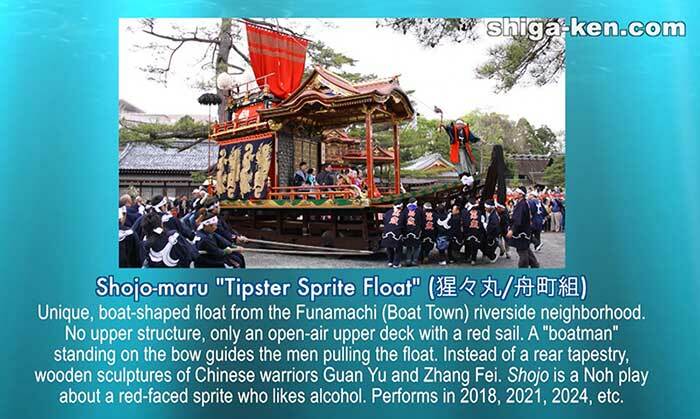 *The order of the floats’ performances is decided on April 13 by the Kuji-tori ceremony (籤取り式の儀) where they draw lots to see which float is No. 1, 2, 3, or 4. After performing at the shrine, each float will move across town mainly along Otemon-dori road (shopping arcade, Kurokabe Square, etc.) to the Otabisho rest place. Along the way, they will stop and perform kabuki three more times with the last performance at the Otabisho by Float No. 4 held from 7:35 p.m. to 8:15 p.m. The map below has a red line indicating the float route on April 15 and the kabuki performance spots (1 to 7) along the way. To enlarge the map, click here. *Location numbers correspond to the numbers in the map below. 4:00–8:15 pm: Successive kabuki performances are held by the four floats as they arrive at the Otabisho one by one. Float No. 1 should arrive at 3:30 p.m. and start performing kabuki at 4 p.m. The last float (Float No. 4) is scheduled to finish its kabuki performance at 8:15 p.m. The kabuki actors are whisked home right after their performance. They don’t stick around for the latter events. They are exhausted and need to sleep and be ready for the next day. After all the floats finish performing at the Otabisho, a short Shinto ceremony is held and the portable shrine that was brought to the Otabisho on April 12 is taken out and carried around the Otabisho a few times before it goes back to Nagahama Hachimangu Shrine. Note that it can get chilly this late in the evening, so dress warmly. The floats start to leave the Otabisho to return to their neighborhoods. 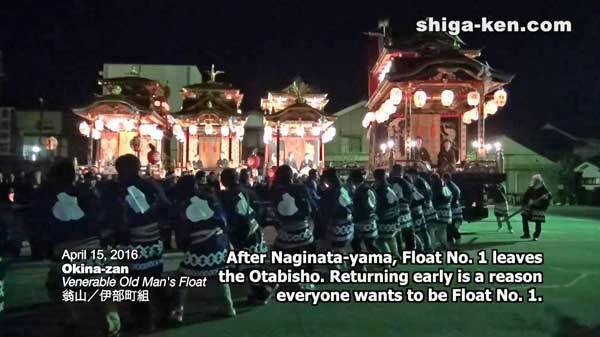 Naginata-yama is always the first float to leave, followed by Float No. 1 and the other three floats in order. The last Float No. 4 might leave as late as 11 pm. The floats go back to their neighborhoods. 9:00 a.m. to 8:40 pm: Each of the four floats will perform kabuki three times this day in their respective neighborhoods in central Nagahama. 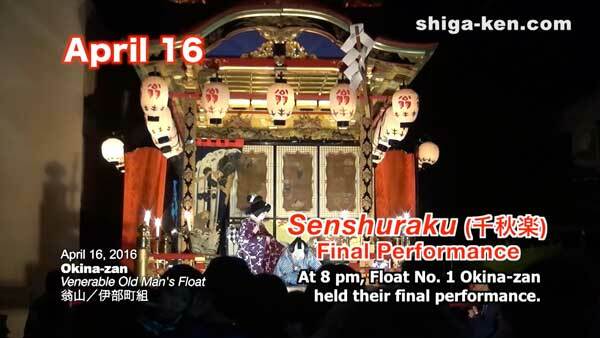 They will also perform on stage at the Nagahama Bunka Geijutsu Kaikan hall for a paying audience from 10:55 a.m. Each float’s final performance of the festival is called senshuraku (千秋楽). It starts from 7:30 p.m. or 8 p.m. (For exact times and locations, see the official festival guide book in Japanese or ask the tourist information desk at Nagahama Station.) Expect to see some tearful kids and relieved parents after the last show is over. 8:00 am: Representatives (including the Sacred Staff Messenger around age 5–7) from the four floats go to Nagahama Hachimangu to return their sacred staffs (zigzag paper streamers) that were mounted on their floats. Not much for tourists. For more information about the Nagahama Hikiyama Festival in English, including the festival’s origins, history, and all the floats, watch my YouTube video (embedded above). I don’t mean to brag, but it’s the world’s most comprehensive video about the festival in English. Being 91 min. long, it’s a long video, but you’ll learn a lot and enjoy the festival a lot more by knowing more about it and knowing what to expect. For festival details in Japanese, see or download the official festival guide book pdf. 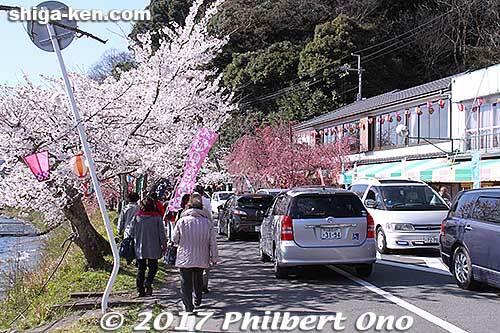 Kaizu-Osaki is deservedly one of Japan’s 100 Famous Cherry Blossom Spots (さくら名所100選 according to the Japan Cherry Blossom Association). 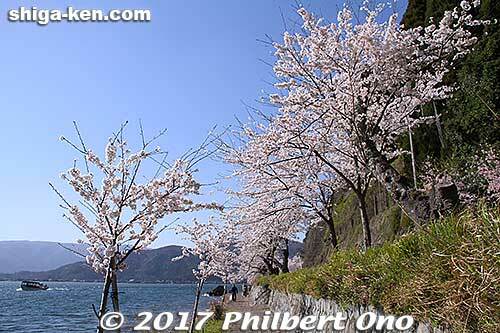 During the first half of April, four kilometers of cherry blossoms bloom along this lakeshore in northern Lake Biwa in Takashima. During the peak bloom period in mid-April, the traffic along the lakeshore road is horrendous. Renting a bicycle at Makino Station and cycling to Kaizu-Osaki is recommended. Walking is also possible for people who don’t mind walking at least 40 min. from Makino Station. 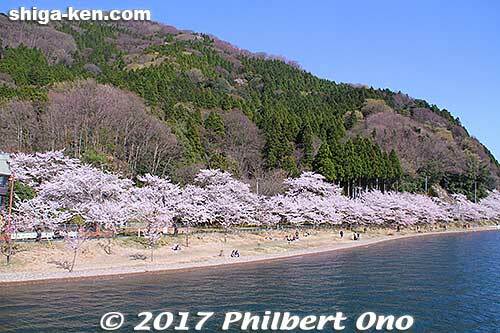 On sunny days, it’s quite spectacular with the cherry blossoms against the blue lake and blue sky with Chikubushima island in the background. But watch out for the cars since much of the lakeshore does not have a walking path. The tunnels are also narrow. Use a flashlight or turn on your smartphone when walking or bicycling in the tunnels. 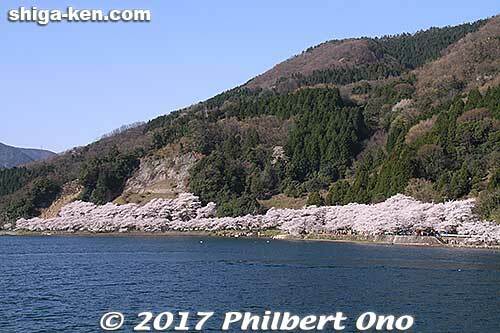 Imazu Port for cherry blossom cruises to Kaizu-Osaki. 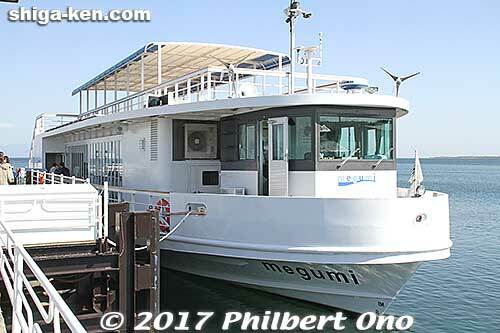 megumi is powered by bio diesel fuel and solar and wind energy. Megumi’s indoor heated cabin with large picture windows. 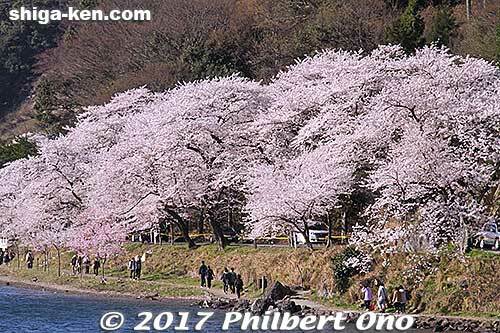 Cruise operators Biwako Kisen (琵琶湖汽船) and Ohmi Marine (オーミマリン) both offer sakura cherry blossom cruises to Kaizu-Osaki during early to mid-April. 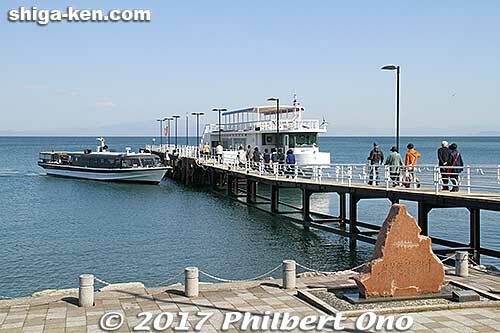 Biwako Kisen has boats departing Imazu Port and Nagahama Port, while Ohmi Marine has boats going from Hikone Port and Makino Dock. Both cruise companies have at least four boats daily, and they may schedule extra boats on peak weekends. The fare is around ¥3,000 to ¥3,500. I highly recommend going on a cruise that also docks at Kaizu-Osaki Port where you can get off the boat and walk around Kaizu-Osaki for about 30 min. before returning to the boat. 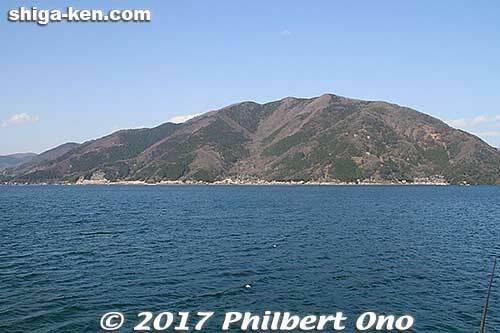 Otherwise, other boats just cruise along Kaizu-Osaki without docking. Note that if the water is rough on windy days, the boat might not be able to dock. 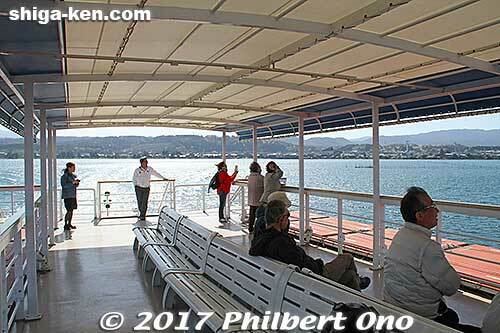 From Imazu Port, the cruise that includes 30-min. docking at Kaizu-Osaki takes about 90 min. round trip. From Nagahama Port and Hikone Port, it takes about 2.5 hours. 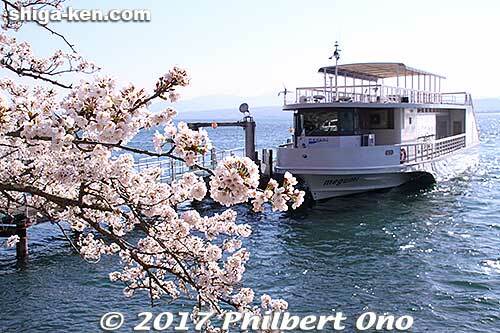 The Biwako Kisen “sakura cruise” schedule is here. 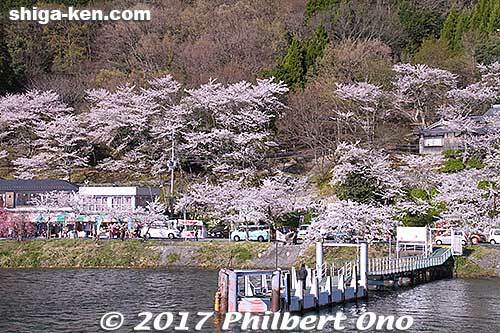 The Ohmi Marine sakura hanami cruise schedule for Hikone Port is here and for Makino Dock here. 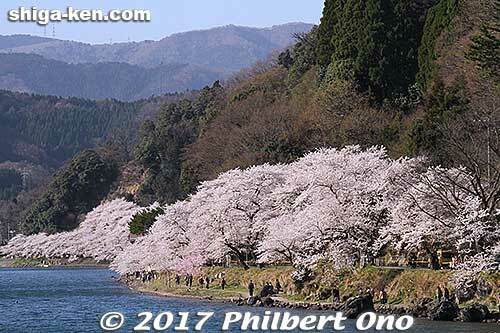 I was lucky to see the sakura in full bloom on a sunny afternoon. Here are some photos. Approaching Kaizu-Osaki Port where Osaki-dera temple is. Beware of heavy traffic when leaving the dock. Look for the pedestrian path. 30 min. is not enough to walk the entire length of the walking path. 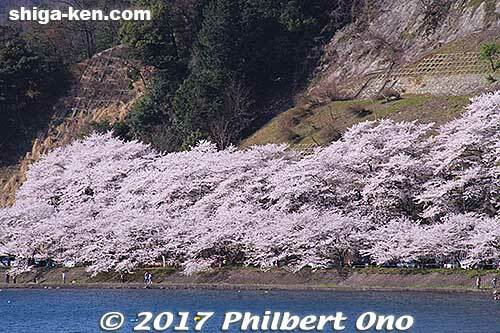 We get another look at the sakura as we leave Kaizu-Osaki. 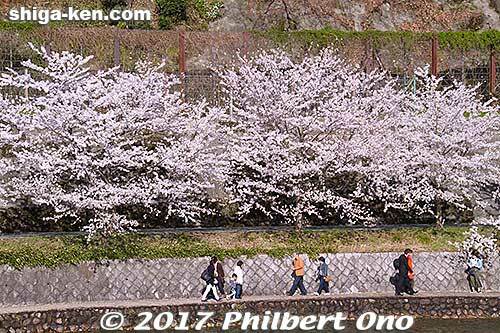 More photos of Kaizu-Osaki here.